At the Sydney Wildlife facility multiple trees came down, fence poles were snapped, shelters blown over and flooding affected all areas. Within a week of the storms passing and damage being done, the volunteers held a working bee at the park to get everything back up and running again. The fencing around the macropod enclosure being reinforced with additional posts put up. Due to the high winds, the shade cloth that provides a visual barrier for the macropods needed to be replaced around the boundary fences. The macropod shelters that were blown over were relocated, reinforced and reinstated. Multiple trees had to be chainsawed into manageable pieces and were either removed or used in the existing enclosures to replicate natural habitats. They even "set up a turtle enclosure to house a resident turtle of the park that had a cracked shell from a fallen tree during the storms. After treatment and shell repair, it is now doing very well in it's new enclosure prior to being released." Thanks to all the wonderful help from the volunteers, the park is now sturdier than before the storms hit. Part of the ongoing vision for the Sydney Wildlife facility had always been to expand and build additional facilities so they can rehabilitate other species and give them the best chance in the wild once released like they have been able to do for the macropods. "we have been very busy with quite a few different species being rehabilitated." "We were lucky enough to be able to assist in the final rehabilitation stage for three elusive Sugar Gliders. 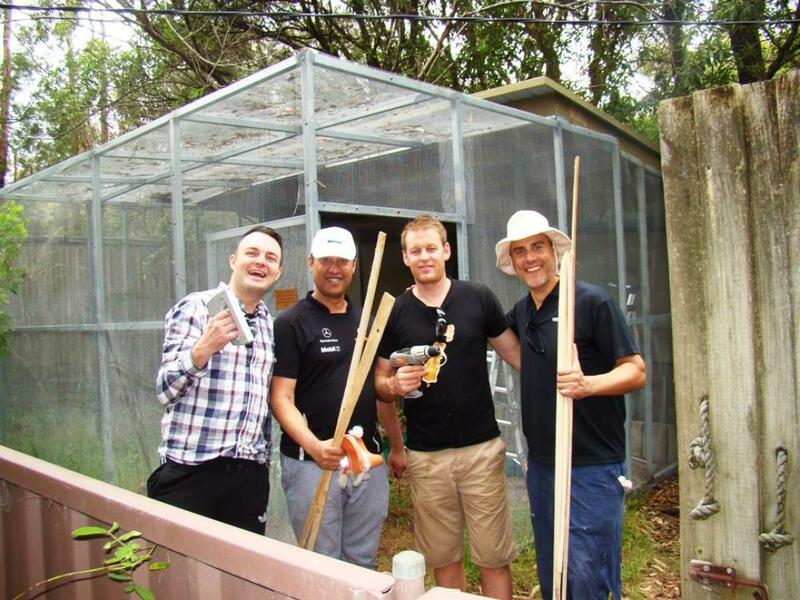 Prior to coming to our facility, they had been handraised by one of our wonderful Sydney Wildlife volunteer carers. Two of them came into care after their home was destroyed and one had been caught by a cat. When they were approaching time for their release they were bought to our facility for rehabilitation where they stayed for a couple of months building up their muscle strength and foraging skills. As they are mostly active at night, we were able to watch them on the infrared motion activated wildlife cameras we purchased from your donations, this showed us how quick they were moving around the facility and successfully finding their food. Once it was determined they were ready to be released they were caught, weighed and then transported to the other side of Sydney for release back where they originated. The nesting box they used whilst in rehabilitation was secured in a suitable tree and they were put back into it giving them a familiar base to release from. The release site was on a property where people could visually keep an eye on the movements of the sugar gliders. After release, they were seen returning to their box on and off before eventually disappearing to start their new life." If you cannot donate money towards maintaining this facility or funding for Southern Cross Wildlife to continue in its excellent work, get 'hands on' and volunteer - IF the Future of our local Wildlife is in Our Hands, and in the problem is often found the solution, get busy - help out by becoming a volunteer. 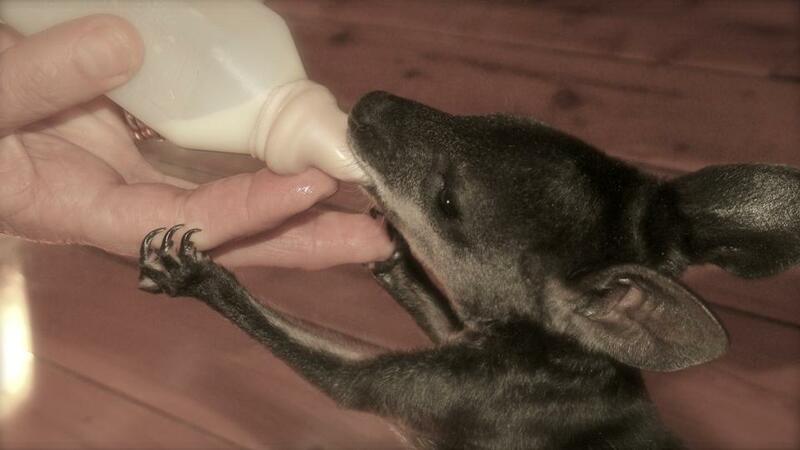 If you have some dollars you want to invest into the right place, from $10.00 to a little bit extra for formula for a baby wallaby for a month or building supplies for facilities, visit the Sydney Wildlife fundraiser page here. The other part of this is to be mindful we live in an environment inhabited by our local wildlife - SLOW DOWN if you're travelling at dawn and dusk on any of the roads where these local residents are, especially Mona Vale Road or McCarr's creek roads or the Warringah Road. SLOW DOWN if you're travelling at night when our nocturnal wildlife may be crossing a road. If you do hit an animal DO SOMETHING - stop where safe to do so and if the creature is injured, wrap it in something warm, secure it in your car safely in a box or on the floor and get it to a vet - always check the pouch for young too. BE HEARD - Pittwater Natural Heritage Association and the Wildlife Roadkill Prevention Association are working to ensure Fauna passes are part of any Mona Vale road upgrades - supporting them is supporting our wildlife. JOIN A BUSHCARE GROUP - helping our local wildlife will be supported by ensuring they have a habitat, by planting species that create a habitat for them in your own garden, by not picking flowers that may seed the next generation of food for some wildlife or stealing rocks or tree seedlings from the bush to save yourself a few coins at your local nursery. The future of our wildlife is in your hands Pittwater, let's handle that future with care. The challenges that wildlife is facing is large and complex—it's normal for individuals to feel powerless. However, our individual conservation actions all add up and they can be the difference between a species surviving or disappearing forever. Ideas for actions can be countless, but here are 10. Set a goal. You can set a basic goal in your day-to-day life for having the smallest negative impact or “footprint” on wildlife and their habitat. Mobilize. Encourage your school, club and friends to have talks and debates on the values of wildlife conservation, and what you can do to help. Consume responsibly. By not purchasing products made from illegally-sourced protected wildlife or their parts and products, you can stop wildlife trafficking from being a profitable enterprise. Buying illegal wildlife products will not only be harming a species, you may get slapped with a fine or even risk jail terms. Find more information from your national or local wildlife authorities or the Convention on International Trade in Endangered Species of Wild Fauna and Flora (CITES). If in doubt, check it out. Speak up. Give your voice to the voiceless. Share your passion for wildlife conservation with your family and friends. Ask everyone you know to pledge to do what they can and to say ‘no’ to illegal wildlife and their products in order to help stop wildlife trafficking. Make sure everyone understands that wildlife conservation includes protecting natural areas in perpetuity, and therefore development that does occur should be well planned and should not be at the cost of the loss, fragmentation and degrading of wildlife habitat. Development should be as people and wildlife-friendly as possible. Visit. Aquariums, botanic gardens, national parks, nature reserves, wildlife refuges and zoos are all home to wild animals. See Earth’s most amazing creatures up close. As you book your summer vacation, plan to visit a national park in your country or abroad. If traveling internationally, look into how hard the country you will visit is working to protect its wildlife and wild places. Vacations with a heart! Open your mind. When most people hear the term endangered species, they think of elephants, rhinos, tigers and other charismatic species. It’s easy to sympathize with these animals, but it can feel like the crimes facing these species are a world away from your own life. If these animals don’t live in your area, you might think there is nothing you can do to help. But most likely you can get advice from your government or a conservation organization near you. Volunteer. If you don’t have money to give, donate your time. Many organizations and zoos have volunteer programs. You can help clean beaches, rescue wild animals or teach tourists about your local habitat. Join. Whether you’re more interested in protecting natural habitats or preventing wildlife trafficking, find the organization that speaks to your passion and join their efforts. If such an organization doesn’t exist in your community, create one! Stay Informed: Learn more about our planet’s species from experts. Do learn about ways to conserve the wildlife. Visit the websites of conservation organizations and their social media tools for the latest. Subscribe to a wildlife magazine and watch nature programmes on TV. Stay informed on the issues, know your impact in the ecosystem and take your part in protecting wildlife. Be informed and support local conservation. Think globally, act locally. Be a whistleblower. Whistleblowers play a critical role in detecting wildlife crimes and holding criminal smugglers accountable. They are the key to fighting fraud and corruption as well which are among the root causes of wildlife crime. If you have the information on illegal logging, fishing and wildlife trafficking, report to the relevant government authorities. Find the hotline or ask to create one if it doesn’t exist!